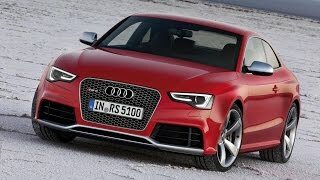 It looks like that Audi is in no mood to take a step ahead of its Audi RS5 model released in 2010, not even after looking at the massive sales gained by the R8 which also created demand for some lesser costing sports model from Audi. 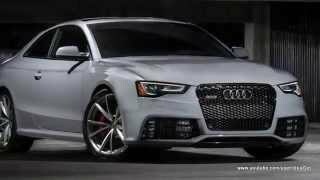 However with this all new Audi RS5 Coupe Sports Edition, company looks confident enough to hit the market with its 75-units. Let us see what else Audi has added to RS5 Coupe Sports Edition. For those, who have driven or seen Audi RS5 knows the interior of Audi RS5 Coupe Sports Edition to an extent. 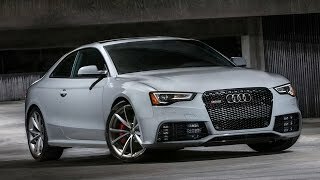 Audi RS5 has been well acclaimed for its sporty interior and talking about upgrades to it is like giving wings to dreams but it looks like team Audi managed the same. The sports seats inside comes with touch of Red and Black carrying RS embossed upon them. The armrests get the flavored contrast with red stitching on them, keeping the same essence on shifter boot also. This entire red and black fever gets its peak with blends of Red Nappa leather in door inserts and the body-color inlays. The steering wheel wrapped in leather is luxurious sign in this sporty arena. The exterior of Audi RS5 Coupe Sport Edition comes with the traditional RS badge and sportive wide 20” alloy wheels rolling impeccably with five-V-spoke design. 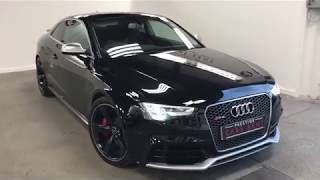 We wont say Audi RS5 Coupe Sport Edition 2015 comes with a benchmark exterior but this luxurious high performance motor hold looks enough catchy to grab eye balls while walking down the lane. The standard Daytona Gray Pearl exterior painted exterior also had some more options for color variant lovers. The Audi RS5 Coupe Sport Edition comes with the standard 4.2 liter FSI Engine mounted in all the RS5 models. The Coupe Sport Edition with its engine paired to seven-speed S tronic twin-clutch automatic transmission and will hammer the street with its robust 450 hp and 430 nm torque. Model works on four wheel drive mechanism and is capable of reaching a top speed of 174 mph and to sprint 0-60 mph in 4.5 seconds. The power created by engine is smoothly transferred to front and rear axles though crown-gear center differential and electronic torque vectoring system.